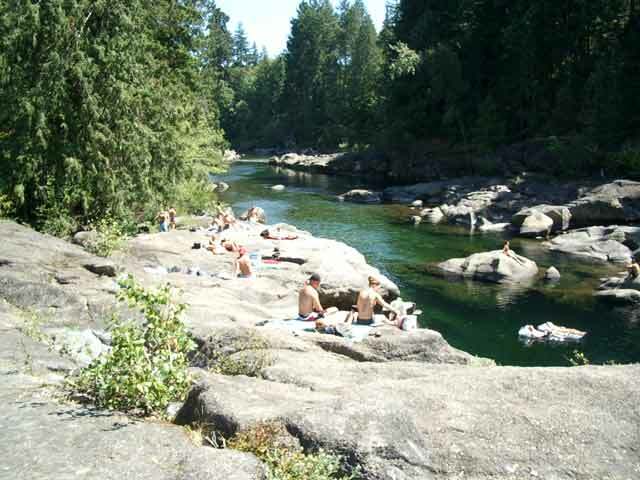 If you enjoy swimming holes, the Nanaimo River has to be rated in the top three in the province of British Columbia. 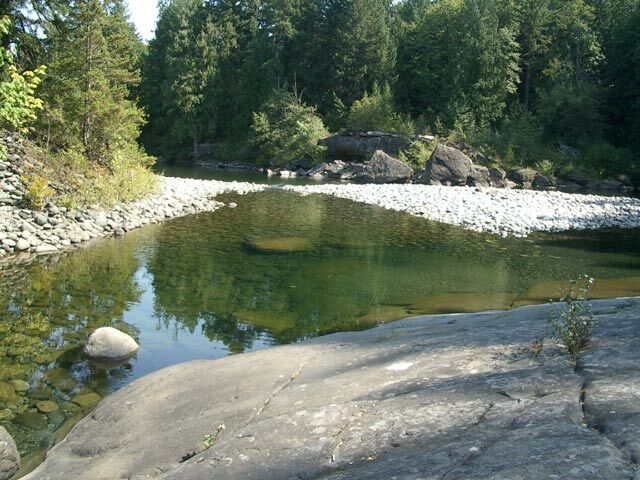 The Nanaimo River is located approximately 18 km (11 miles) south from downtown Nanaimo on Hwy 1 near the small community of Cassidy. "Nothing Like it in the World"
Words like "Nothing Like it in the World" have described the deep pools formed from eroded sandstone from years of water turbulence. 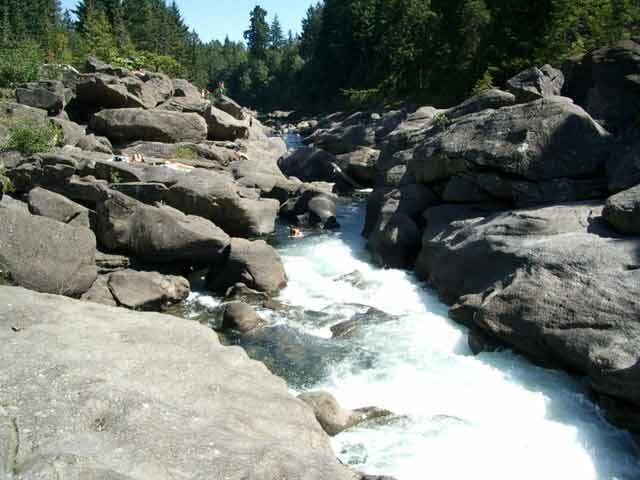 During August the water can warm up to around 24-25° C (75-77° F) as it flows over the sun-baked rocks creating excellent swimming throughout the length. The Nanaimo River starts up in the Nanaimo Lakes area just north-west of Cassidy. 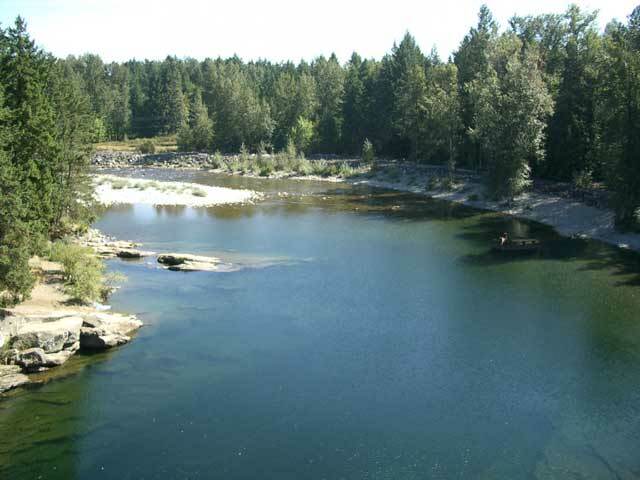 A chain of four lakes are found 25 km (15.5 miles) up the Nanaimo River Road from Hwy 1 near The Bunjy Zone. The river then flows east towards Cassidy ending at the ocean just north of Cedar at a saltwater estuary part of the Pacific Estuary Conservation Program at Mud Flats. 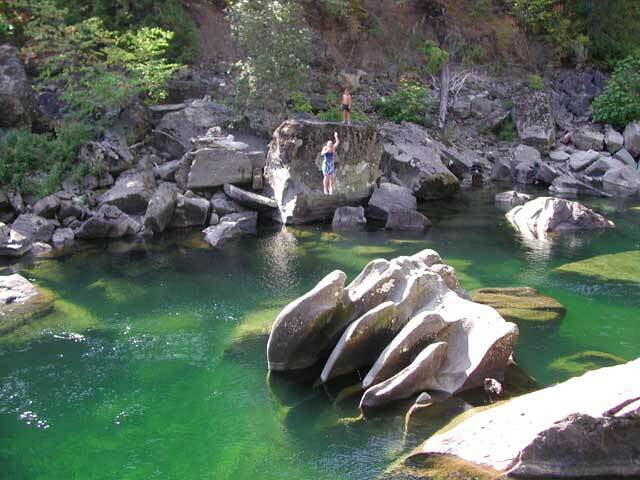 If you enjoy swimming holes the selection of pools found along the whole length of the river is quite varied from the very private to the well-populated. Please remember though, there are no lifeguards present at all on the river and some areas are quite dangerous and have to be respected when attempting to swim or hike into them. Warning - some people in the past have experienced serious accidents with some fatalities occurring by not being cautious alongside the river. Please be careful when swimming, especially through the underwater caves that have been formed by water erosion against the large boulders. Once entered, strong water turbulence and currents have prevented swimmers from getting out of the caves. Watch for some posted signs along the river plus be aware of the hazardous currents and slippery rocks along the river edge, especially during high water periods. Just a note though not all dangerous areas are posted, so a careful inspection is required of the possible hazards especially if you're new to the Nanaimo River. Also there are no lifeguards or safety equipment present along the river's length. 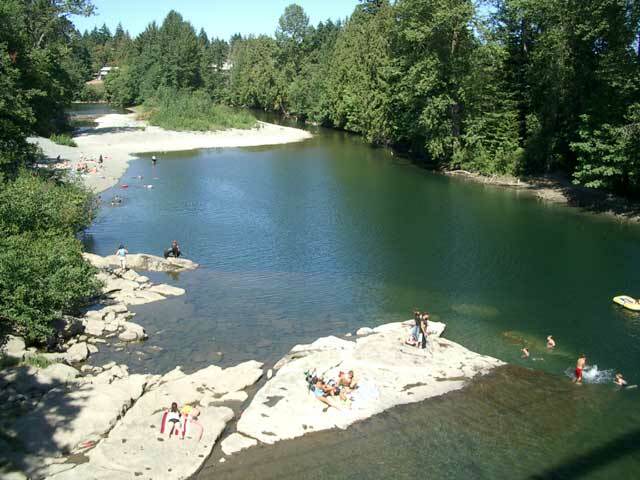 Located up from Wild Play at the Bunjy Zone on Nanaimo River Road from Hwy 1 by 3 km (2 miles) is a great place for you to get introduced to a Nanaimo River swimming hole. Look for cars parked by the road and the trail that leads towards the river. 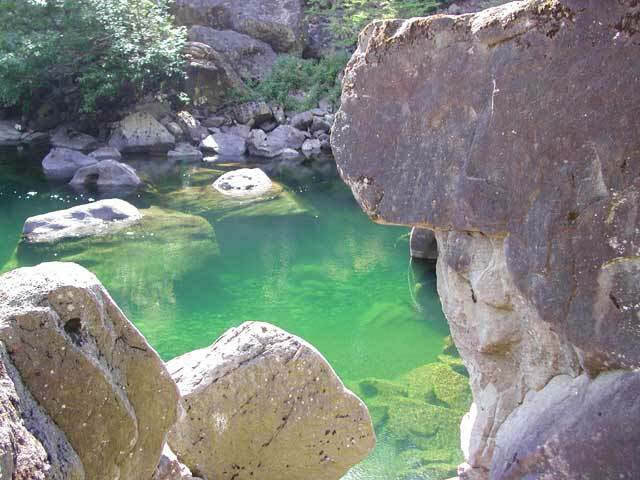 Beautiful crystal clear warm water with some deep pools are there offering a quite varied swimming area. There is remnants of an old bridge trestle that once crossed this section of the river. The tops of old concrete foundations remaining from the bridge make good private areas if you enjoy sun bathing or jumping off but remember to respect the river. The main swimming of 'The Trestle' is downstream from here at a location that allows easy access into the river. The swimming hole downstream from 'The Trestle' really fills up fast in the summer time with lots of 20-year-old kids arriving in the early afternoon. Just a warning: There can be a lot of ruckus, beverage drinking and swearing going on so just be prepared. A good time to go is really early in the morning if you want to avoid the crowds. Unfortunately, you will notice the odd bit of litter carelessly left there. 'The Power Lines' swimming hole have always been a favourite spot to go to because the crowd can be a little smaller. 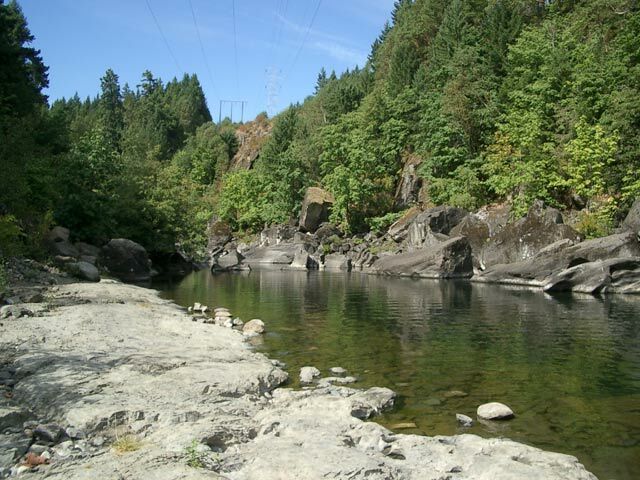 Situated directly below a BC Hydro transmission power line this swimming hole requires you taking a 10-5 minute walk involving the trail going down a steep bank. To get here travel 2 km (1.3 miles) above the Bunjy Zone on Nanaimo River Road to a parking area next to a BC Hydro Transmission right-a-way. Walk through the gate and follow the gravel road towards the river. Once overlooking the river you then take a trail that leads downstream that eventually goes down a bank to the river. Once you're down at the river make a mental note of where the trail comes out through the bush. There is a small rocky beach and some large rocks to lay on. 'The Powerlines" also features a large hole where the swimming in the emerald green water is great. 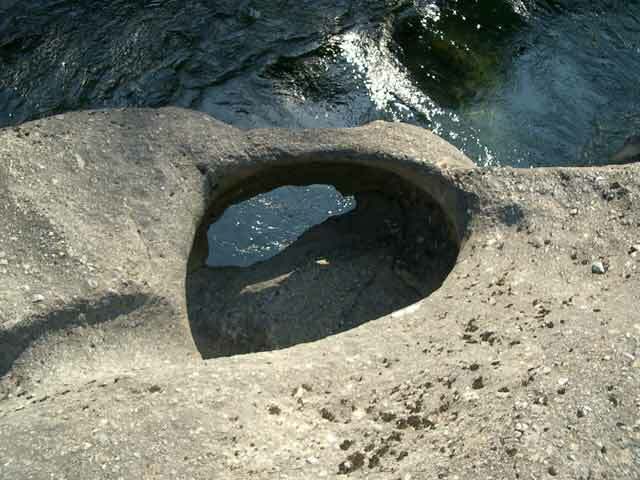 There are also a number of large boulders out of the water making it easy for you to jump into the pool. 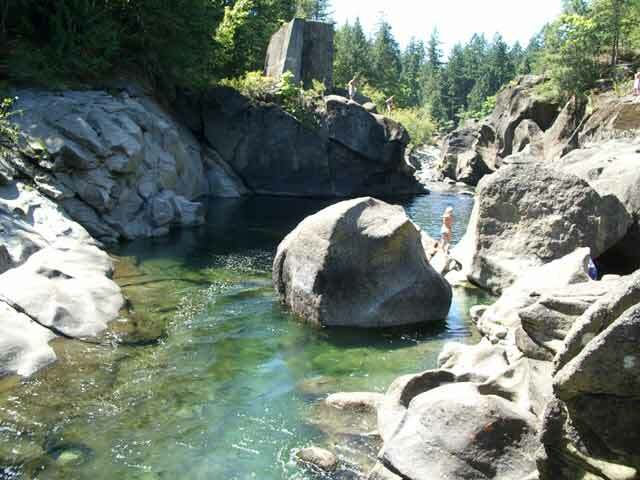 The swimming holes of the Nanaimo River above the Trans-Canada Hwy 1 are really not suited for young children. There is a small beach area that is more suited to kids near the rest stop close to the Cassidy Pub on Trans-Canada Hwy 1 called 'The Highway Bridge.' Park at the rest stop next door to the Juniper Café at Beck Road and look for the trail that leads to the river. There is a small homemade raft here plus an area containing a sandy and rocky beach. Please still be cautious and keep an eye on your kids. The downstream rapids can be quite fast especially in times of heavy runoff or in times of water release from Fourth Lake Reservoir. Another favourite spot for the kids is just below the bridge past the Indian Reserve going east along Cedar Rd. often referred to as 'Cedar Bridge' swimming hole. Here you can find the river slowly meandering along making its way to Mud Flats. The beach is a little larger than most areas on the river and has the advantage of being wide open so you can keep a good watch on the children. For those who enjoy a clothing optional beach there are a few areas tucked away from the crowds where you can enjoy some privacy. Look for a trailhead about 1 km (.6 mile) west of the junction of the Nanaimo River Road and Nanaimo Lakes Road. The trail is around 400 metres (1,300 feet) long through the forest. Once you're at the river, there are a couple of pools either downstream or upstream direction. If you do happen to make the adventure to the swimming holes in the Nanaimo River, make sure you have a mask and a snorkel. A big treat is to view large spawning salmon and other fish swimming in the river including cray fish that you can find crawling along the river bottom. Then located at Cassidy at the Nanaimo River Bridge is WildPlay Elements Park Nanaimo. 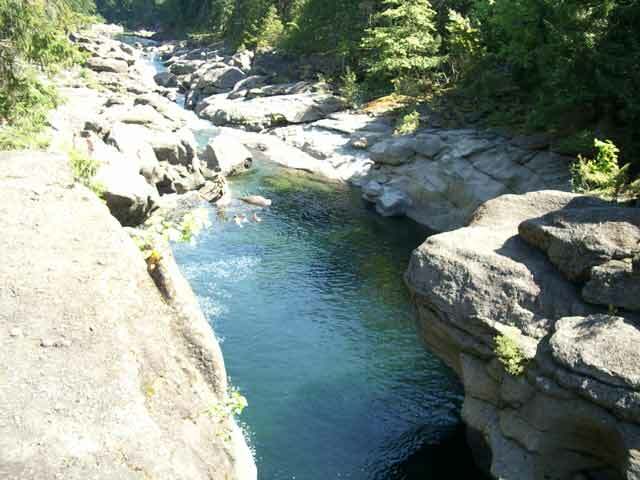 Definitely one of the main attractions along the Nanaimo River, this facility includes a bunjy jump of around 44 metres (143 feet) off a bridge into an incredible pool just upstream from the bridge on the Trans-Canada Hwy 1. 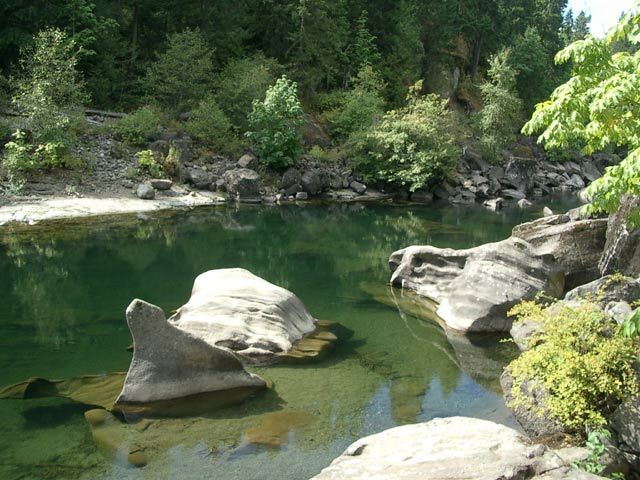 Just a side note on the Nanaimo River regarding the rocky terrain above and below the water. If you enjoy looking at what nature can do with forming the natural landscape the rocks and boulders found here are no exception. Boreholes, fan-shaped rock outcrops and boulders stacked over each other line the river's sides. There is an annual Steelhead run February to March plus Coho salmon, Cutthroat and Rainbow trout available. The fishing is also very good in the Nanaimo Lakes area from April to June and then later in September or October with both cutthroat and rainbow trout present. 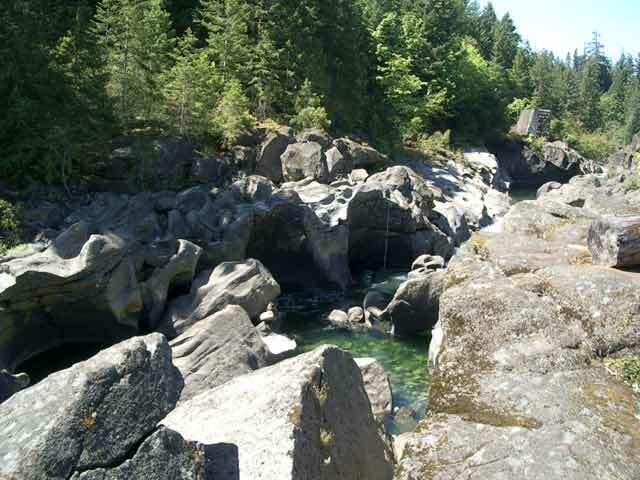 Then for rock climbers there are the two outcrops called the Nanaimo River Crag located near the Power Line swimming hole. The crag includes both a lower and upper section providing various routes up the sides of the rock face.